Studies suggest that curcumin is thought to slow down the inflammatory pathway if used in the treatment of inflammatory conditions such as arthritis. Clinical trials have found it to be effective for relieving pain and swelling in people with osteo and rheumatoid arthritis. Curcumin is also thought to be a powerful antioxidant. Oxidative or free radical damage is believed to be one of the main mechanisms behind ageing and age-related illnesses. Curcumin’s antioxidant action in the body is two-fold: it helps to neutralise free radicals in its own right AND it stimulates the body’s own antioxidant enzymes, delivering a two-pronged attack against invaders. As an anti-inflammatory and an antioxidant, curcumin is also believed to support brain health and have beneficial effects on several factors known to contribute to heart disease. As a naturally warming spice, it may also help to improve digestion and circulation. So there is a lot to like! Keep an eye out for this orange superfood because it is proving increasingly popular. From food supplements to turmeric lattes, there’s a good chance you may have come across it already. 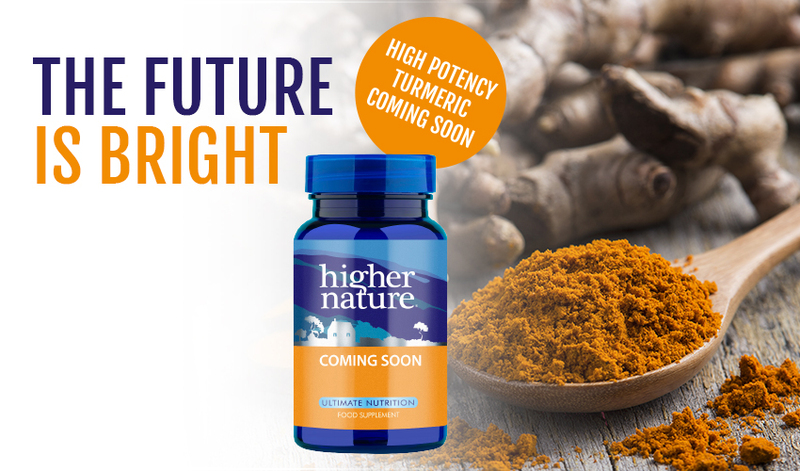 Our nutritionists are currently formulating a new product, a high potency turmeric that will capture all the benefits of biologically active curcumin, offering enhanced absorption and therapeutic doses for maximum effect.